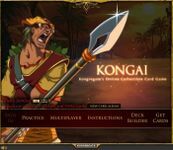 Kongai is billed as Kongregate.com's collectible card game, but doesn't play like a card game. Additionally, not having cards is not a significant disadvantage, because the cards are well-balanced and skillful play is drastically more important than the cards used. The game is flash-based - a 2-player duel where each player has 3 characters from a pool of 40 with a wide array of unique abilities abilities. Gameplay is primarily a weighted rock-paper-scissors system where being able to read your opponent's moves is essential for victory.